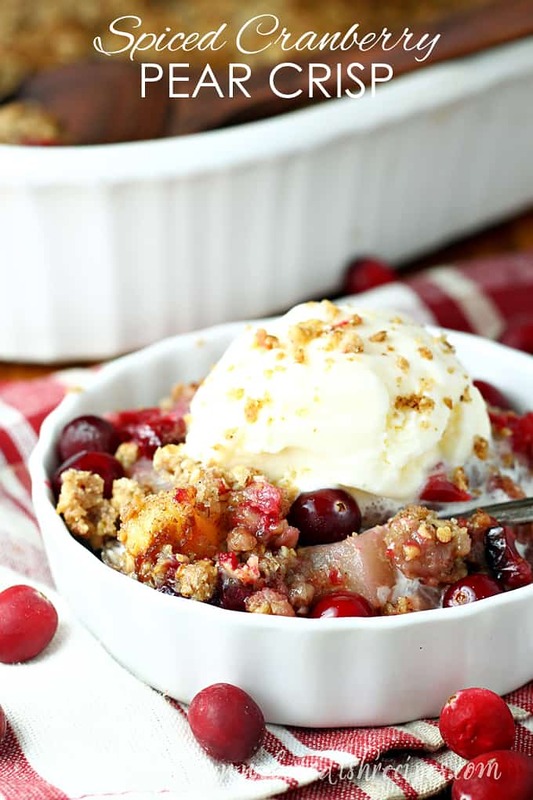 SPICED CRANBERRY PEAR CRISP — Fresh, in season pears and cranberries are lightly spiced and baked with a crumbly oat topping in this comforting fall dessert. Delicious served warm with a scoop of vanilla ice cream. 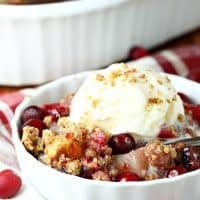 Crisps and cobblers are one of my favorite desserts of all time, and this Spiced Cranberry Pear Crisp is just perfect for fall, or even Thanksgiving or Christmas dessert. There’s something about a warm crisp, topped with some whipped cream or vanilla ice cream, that is so inviting when colder weather arrives. And with it’s seasonal fruit, beautiful colors and aromatic spices, this pear and cranberry crisp is something I make often during the holiday season. Plus, the whole house smells wonderful while it’s baking. I get a lot of “What are you baking mom? 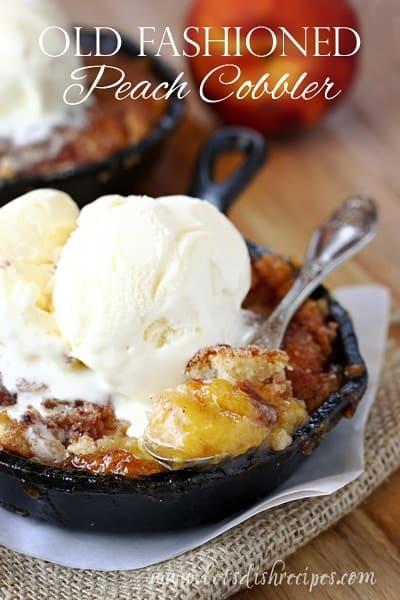 It smells really good,” kind of comments from my boys whenever I make this comforting dessert. I really love that this dessert is so easy to make, and practically foolproof. My family would just as soon eat this for a holiday dessert as some fancy dessert I spent hours making. This crisp is the kind of dessert that’s perfect for sharing with friends and family, and doesn’t leave you stuck in the kitchen baking all day. And with hints of cinnamon, cloves and nutmeg, it really does put everyone in a festive holiday spirit. Of course, I highly recommend serving this crisp warm, and topping each serving with a scoop of vanilla ice cream. Really, that’s the way I recommend serving all crisps. And this does reheat beautifully in the microwave if you happen to have leftovers. I may or may not have been caught eating the leftovers for breakfast! If you’re looking for a simple but satisfying holiday season dessert, I highly recommend this Spiced Cranberry Pear Crisp. It’s sure to be a hit wherever you serve it this holiday season. Be sure to save this Spiced Cranberry Pear Crisp recipe to your favorite Pinterest board for later. 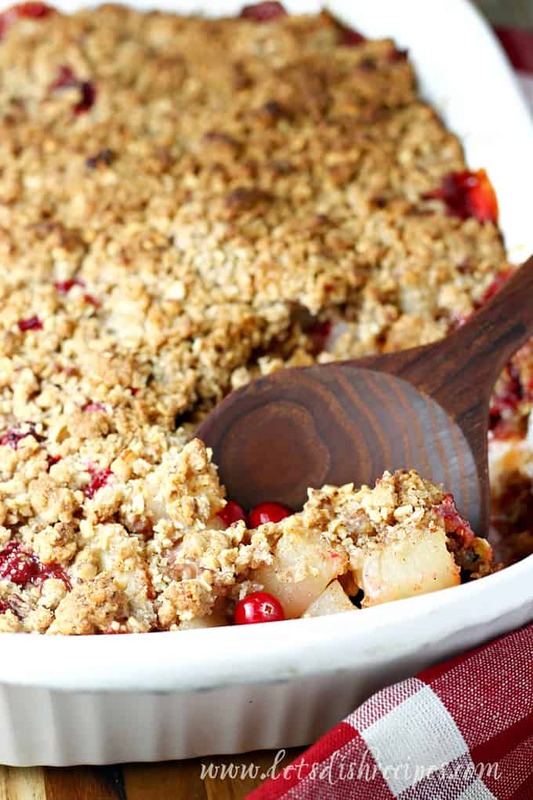 Fresh, in season pears and cranberries are lightly spiced and baked with a crumbly oat topping in this comforting fall dessert. Delicious served warm with a scoop of vanilla ice cream. Preheat oven to 400 degrees. Lightly grease a 9 x 13-inch baking dish. In a large bowl, toss together the filling ingredients until well combined. Pour into the prepared baking dish. To make the topping, combine the flour, sugar, spices and oats in a medium bowl. Cut in the butter until mixture resembles coarse crumbs. Stir in pecans. Sprinkle the topping mixture evenly over the fruit. 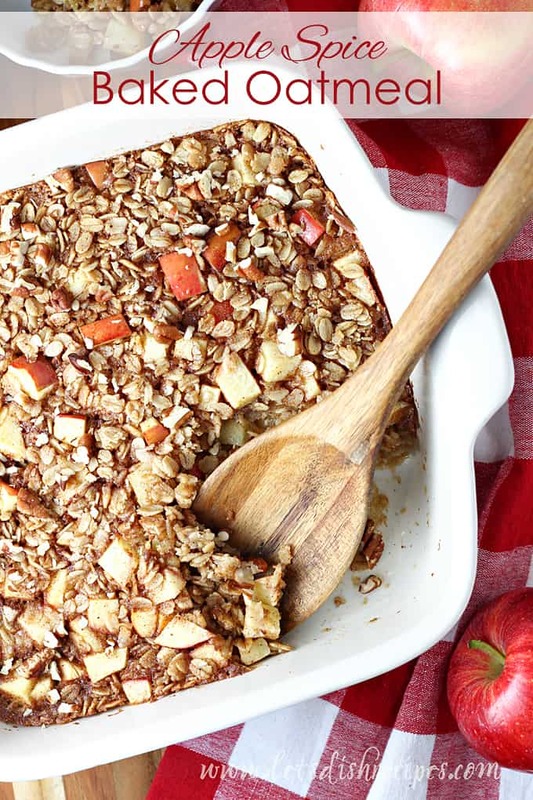 Bake for 70-90 minutes, or until topping is crisp and golden brown and fruit is bubbly. Serve warm topped with vanilla ice cream. 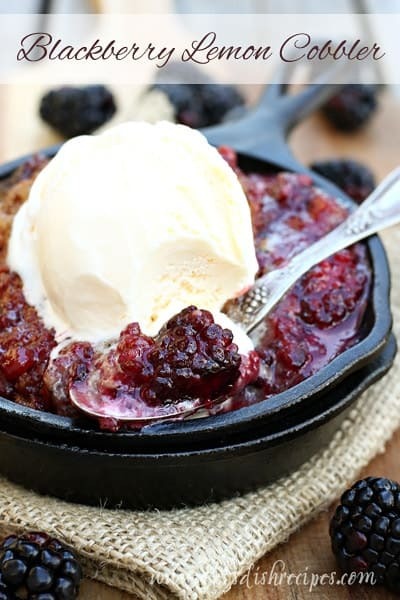 Is it possible to use frizen cranberries in this recipe?